A view of pool tables on display in our store. Watch a two-minute video on how they are made. Thank you for your interest in our pool and game tables. 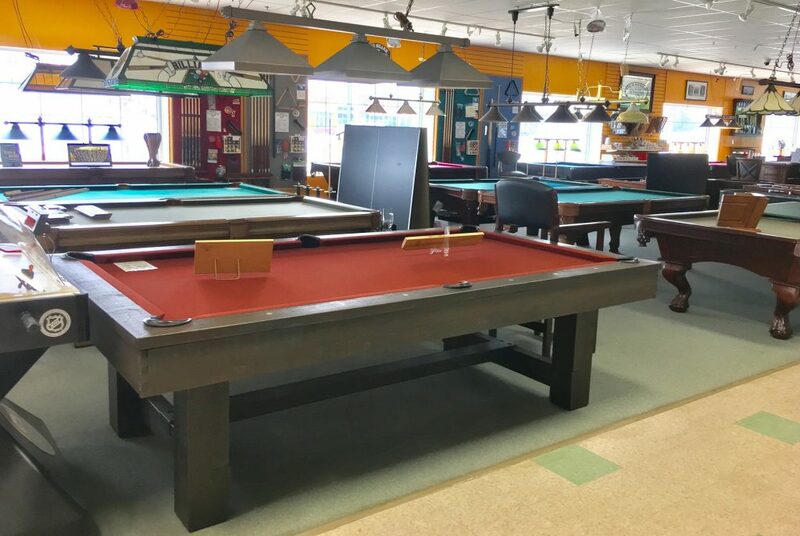 We are one of New England’s largest billiard and game table stores because we have been taking our games seriously for over 30 years. 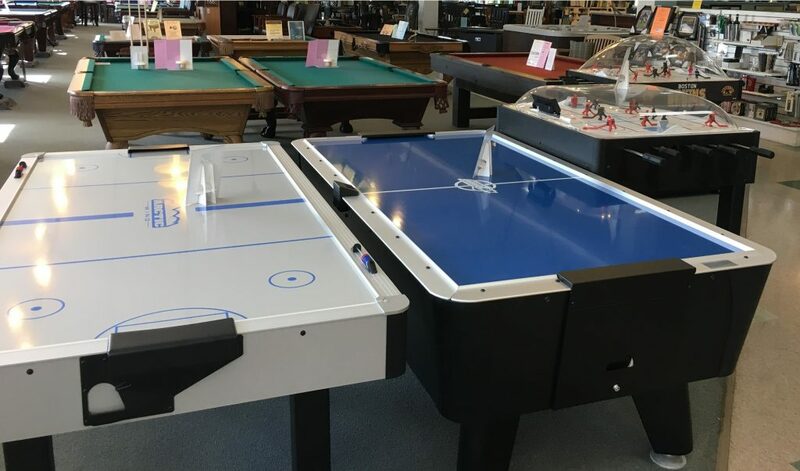 We carry all major brands of professional-quality slate pool tables; plus bars, bar stools, poker tables and arcade-quality games to help you put together a spectacular game room for your home, business, restaurant or pool hall. Seeing is believing and you really can’t properly choose a game table until you play on it. That’s why we usually have almost all of our pool tables completely set up with slate, felt and balls. Every air-powered turbo hockey, foosball, ping pong table, etc. is available to try before you buy. There are big differences, especially with pool tables—and those differences directly relate to how much fun you are going to have when you play at home. We carry all the major brands so you can do your own side-by-side comparisons. “So what?” you say. “I’m no Minnesota Fats.” Well, neither was he! (That’s an old pool player’s joke). It is our opinion that you should at least be given a chance to see what you like. If you try two tables and you don’t see the difference, buy the cheaper one. However, if you see even a small difference, consider this: After having six months of owning your own table at home, you are going to be able to see and feel the differences in play that you do not notice now. We don’t want you to wish you had decided on the table that was more fun back when you had the chance. You don’t need to be an engineer to choose what you like, but if you do want to look at the nuts and bolts of why some games perform differently, we have the tools, displays and factory-trained staff to show you as much as you wish to know. We are not high-pressure people. We’ll give you as much, or as little help as you wish. We have no secrets, and our prices do not vary with how nice a car you drove in today. We’ll let you take home our entire pool table price list with you. We feel that if you just tell the truth, you don’t have to be afraid of which competitor or customer knows what. Unfortunately, we cannot publish our prices online, email them, or even mail them outside our market area due to regulations required to be an authorized dealer of most major game table manufacturers. And what good does it do to have a price on a table that you have never seen or tried? For details, have a look at our Internet Sales & Pricing Policy page. Are we cheap? Guaranteed, in writing, for 30 days and 300 square miles. And that means from when you buy your table until 30 days after you take it and even if we put your table on sale. The details are posted right next to the cash register for everyone to see. Building your game room is often about more than just the fun stuff. Your room should also look “put together” and reflect your own individual sense of style. Our design advisers are always on duty to help you with color and style selections. Our Design Center features multiple lighting sources so that we can show you wood and fabric colors in whatever light you will have at home. We have samples that you can take home to match to your carpeting, wallpaper or drapes. We love to put together a completely coordinated game room and we’ll be happy to put together a special “Package Price” on everything that you need.